Note: This feature is only available with a Microsoft Exchange Mailbox , if that used by your organisation. If your email system is hosted by other providers such as Gmail, out of office messages via Outlook may not be possible. 1. Click the File tab, and then click the Info tab in the menu. 4. If you want to specify a set time and date range, select the Only send during this time range check box. Then set the Start time, and then set the End time. 5. In the Inside my organization tab, type the message that you want to send within your organization, and in the Outside my organization tab, type the message that you want to send outside your organization. 7. If you selected the “Only send during this time range” option in step 4, the Automatic Replies (Out of Office) feature will continue to run until the date and time set for the End Time in step 5 is reached. 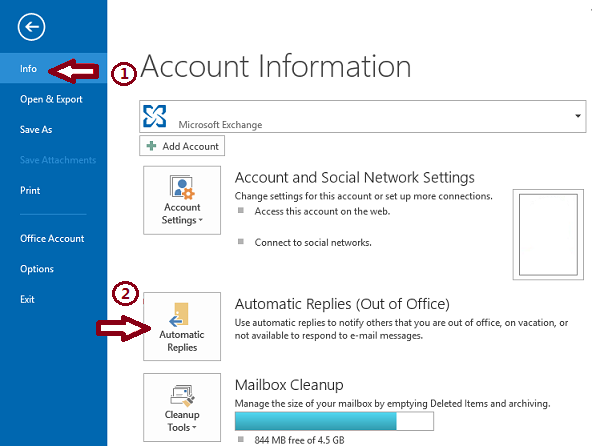 The “Automatic Replies (Out of Office)” or “Out of Office Assistant” feature is not available on non-Exchange accounts, such as Outlook.com (formerly Hotmail), POP3, IMAP. If you don’t see Automatic Replies after selecting File, you’re probably using a Gmail, Yahoo, or other POP or IMAP account that doesn’t support the Outlook Automatic Replies feature. You can setup a rule that will reply to incoming messages, but only if you leave Outlook running.